The TRAPPIST-1 solar system is the most unique one we've seen so far and could offer amazing possibilities for life. 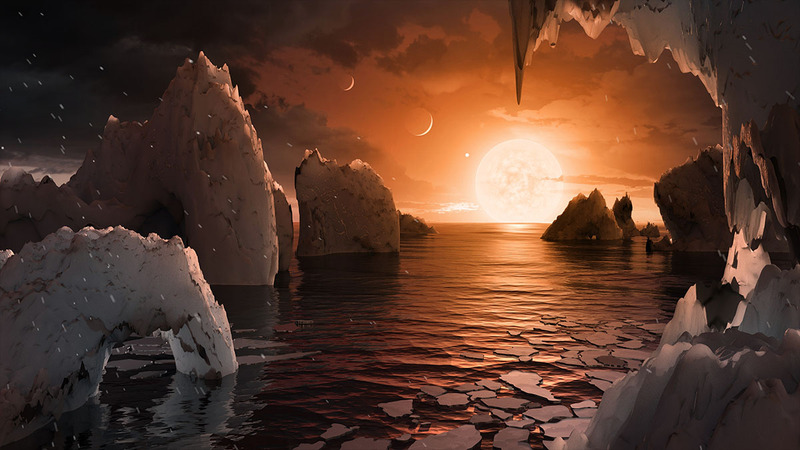 When you see concept art of alien worlds, you often end up with images of skies that feature numerous other planets close by, looming over deserts or oceans, sometimes turning the image into a game of count the worlds. But as it so turns out, there is a place in the universe where skies are just lousy with other planets and it’s just 40 light years away around a red dwarf star known as TRAPPIST-1. It’s a dense little system with seven planets. Oh, and just another little curious fact. Three of them may well be habitable because all three are in the perfect spot to receive just enough energy to have liquid water without it boiling away or freezing, and where there’s water, there is virtually always life. Now, remember that a habitable world around such a star would be nothing like Earth, despite probably being the most typical kind of habitable planet in the cosmos. It wouldn’t have nights and days but night sides and day sides because it would be tidally locked, and it would have to deal with violent bursts of radiation from a star that convects to its very core, but there may be plenty of places for life to thrive, shielded from temperature extremes and X-ray bursts in caves and deep oceans. But should whatever life exists there journey to the surface when its calm, if it has eyes as we know them, it could look up at the sky to see planets twice as big as we see the moon making their way across the ball of fire that is its parent star, and quite possibly have its interplanetary siblings looking right back at it. This may sound like the plot of a science fiction novel, but there’s really a place out there where it’s a very plausible outcome. Remember that red dwarfs age very slowly, giving life nearly 100 billion years to take hold in one form or another, versus the 5.5 billion year viability period for worlds in orbit around Sun-like stars, and by the law of large numbers and the sheer quantity of organic material that can seed life floating around on comets or asteroids that constantly hit planets, something may be more likely to evolve than not on at least several of the TRAPPIST-1 worlds. Of course, while it’s a tempting exercise to think of alien civilizations around this star looking back at us from the cosmic equivalent of across the room, there’s still much that we don’t know about this system and will need to confirm.